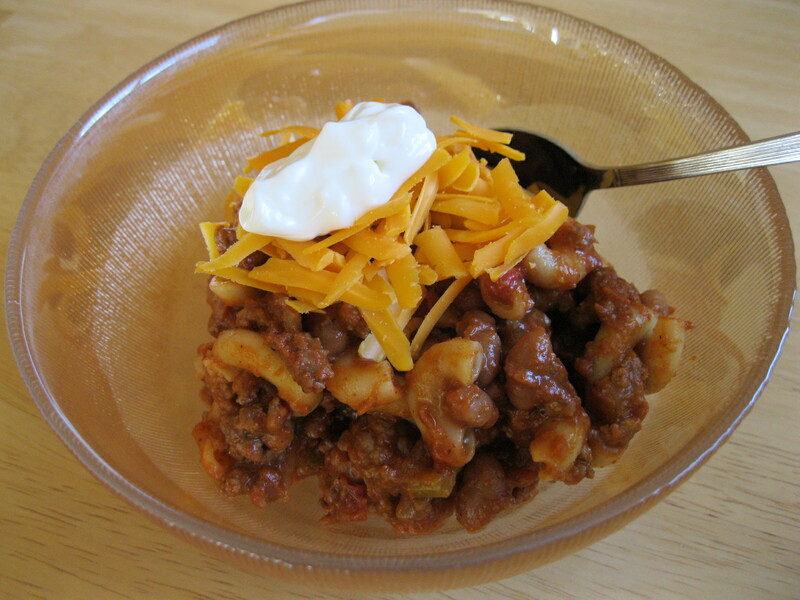 This is a nice, mild version of chili, with the surprising addition of elbow macaroni. It got the thumbs up at dinner. (I’m anticipating the leftovers to taste even better!). You could certainly ramp up the heat with the addition of more chili paste/powder, cayenne pepper, red pepper flakes, etc, but we don’t mind if our foreheads don’t break out into a sweat while we’re eating 🙂 I used 1 1/2 pounds of ground beef and 1/2 pound of sausage meat, just because that’s what I had on hand. It was a good ratio and I would stick with it when I make the recipe again. You can check out the original recipe here. In a large saute pan, saute chopped onion and celery until tender-crisp, add minced garlic and red chili paste, saute for another minute or so. Remove to a bowl. In the hot pan, brown ground beef and sausage meat until pink is all gone, seasoning as it is browning with 1/2 tsp salt, freshly ground pepper to taste, and 2 tablespoons of chili powder. Drain if necessary and place meat back in pan. Stir in sauteed onions, celery, diced tomatoes, tomato sauce and kidney beans. Over medium heat, bring mixture to a high simmer, and continue to simmer over low heat about 20-30 minutes, stirring often. Taste for seasoning, adding more chili powder as desired. While chili is simmering, cook macaroni according to package directions. Drain. When chili is ready to serve, stir in macaroni. 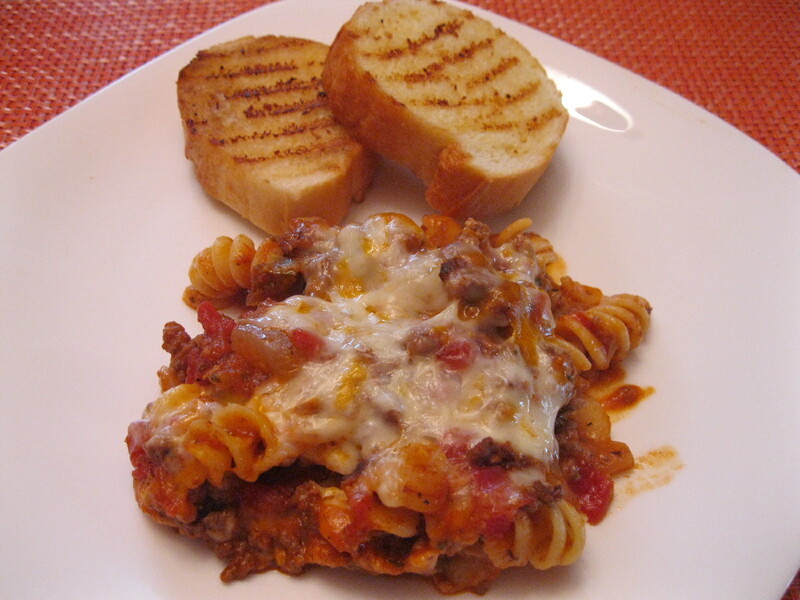 If pasta has cooled, let the chili come back to a simmer before serving. 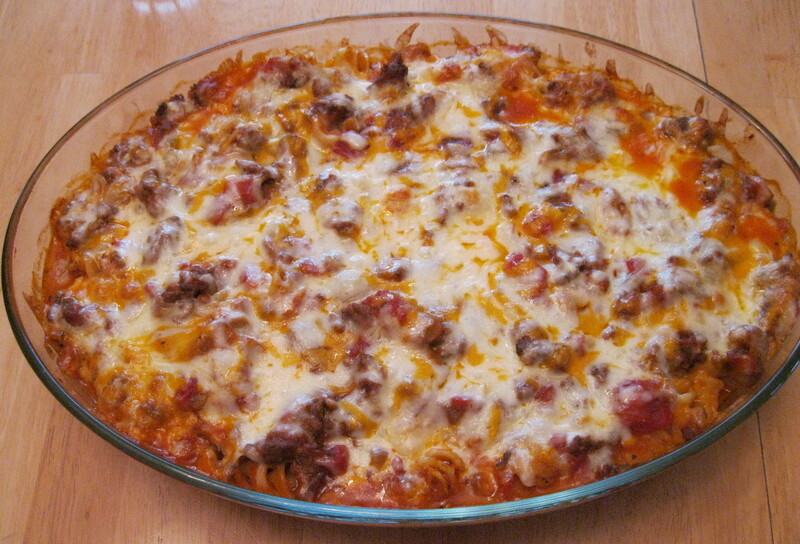 Top individual servings with grated cheese and a dollop of (no-fat) sour cream. This is not a recipe for the faint-of-heart, it’s quite a bit of work, but for a special occasion, worth the effort! In our family, it’s Joel’s favorite birthday dish, and has also become a tradition for Christmas Eve supper. Its origins are German; if you google, you will find all sorts of recipes and youtube videos both in German and English, with all sorts of variations. Here is mine, not video, but variation:). 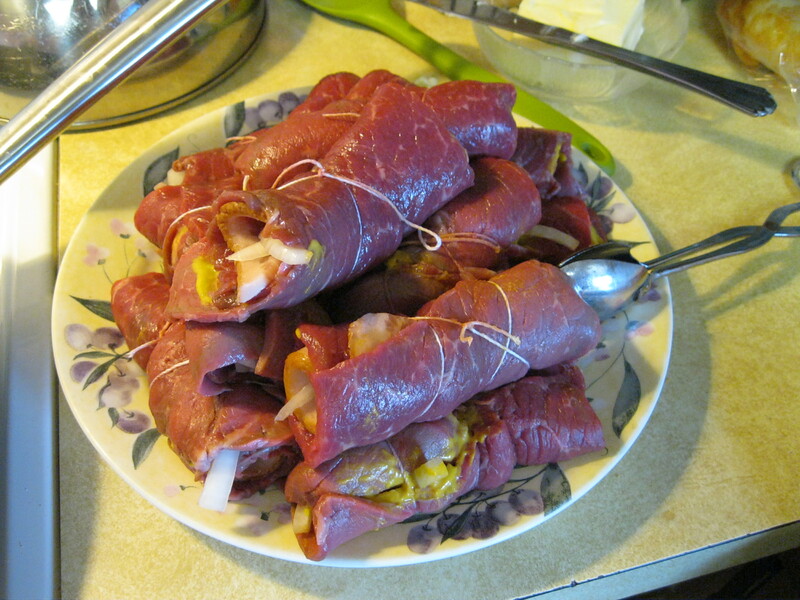 One slice rouladen per person, plus some extra for hearty appetites and leftovers. Although you can slice and pound the meat yourself to the appropriate thickness, the easiest thing to do is ask the butcher to slice the meat for you. 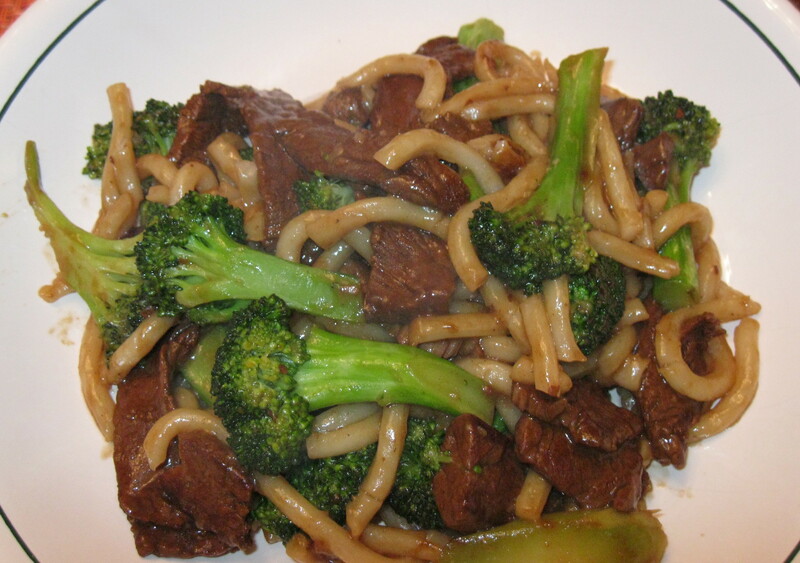 It’s round steak, cut into large, very thin pieces. It’s an art form to be able to slice good slices! On a large cutting board, lay out the slices. I like to cut them in half, that’s the way my mom does it, but for quicker prep, leave them whole. Generously spread each slice with mustard and sprinkle with a bit of salt and pepper. 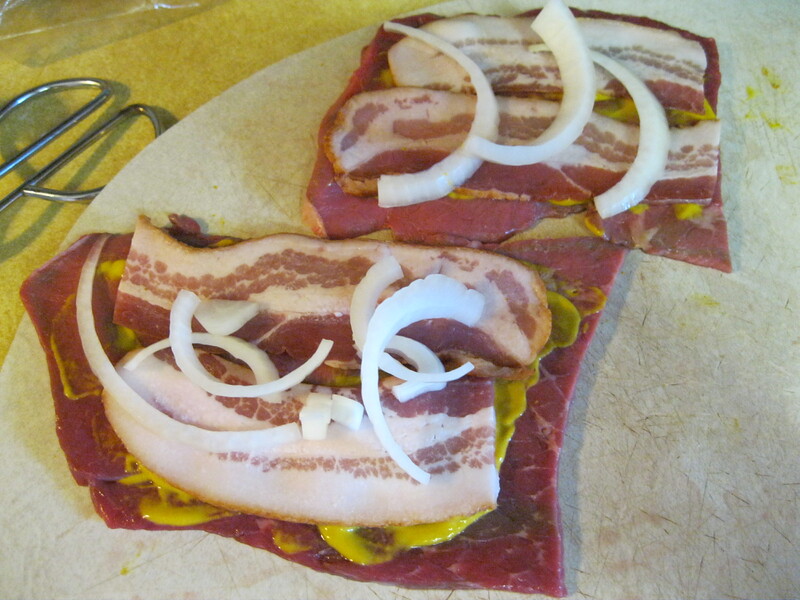 Lay the bacon strip down the middle and add some onion slices. Starting at the shorter end, roll into a tight roll and tie with string. 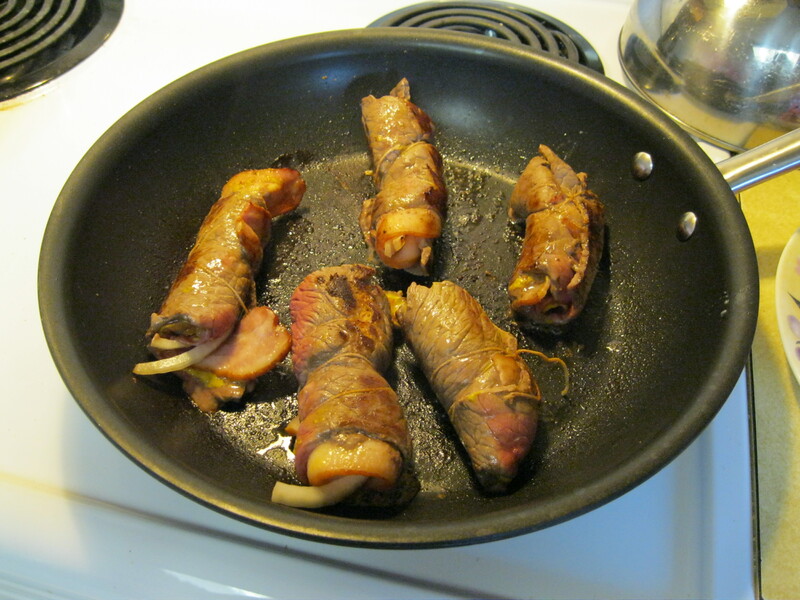 When you have several tied, brown them quickly on all sides and then place in a casserole or roaster. To the make the sauce, I mix the gravy mix into the mushroom soup and then whisk in the water. Pour over the rolls and cover. 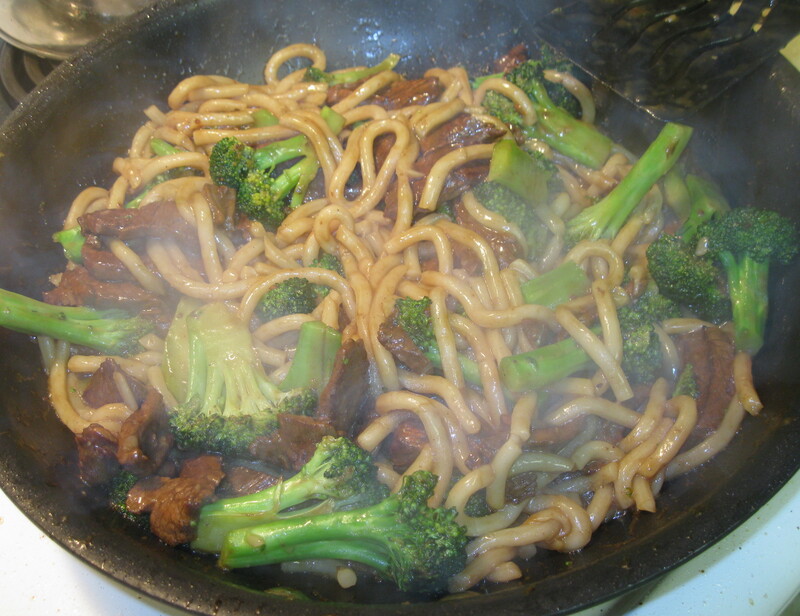 Bake at a low heat, 300-325 F, for about 1 1/2 – 2 hours, stirring occasionally and testing for tenderness. Serve alongside mashed potatoes, corn and salad. Yum! Add a quarter dill pickle to each slice before rolling. The dill pickle gives the gravy a subtle layer of taste dimension that I like, but the boys were always grossed by the idea, so I’ve stopped adding it, but now that they’re all grown up, I bet I could go back including it, and they wouldn’t mind! 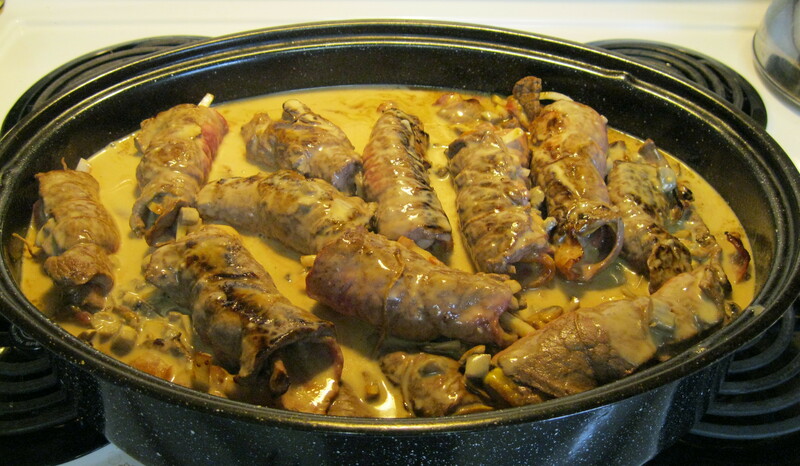 The other thing I used to do (when life was seemed less complicated), was cook to the rolls in the drippings from the deglazed pan and a cup or two of beef stock, and then thicken the gravy just before serving. But now, the mushroom soup trick eliminates that extra gravy step. Sides of cooked red cabbage and potato dumplings or spaetzle are also very tasty (and more authentic).